One of our smaller pitches with a fantastic view. 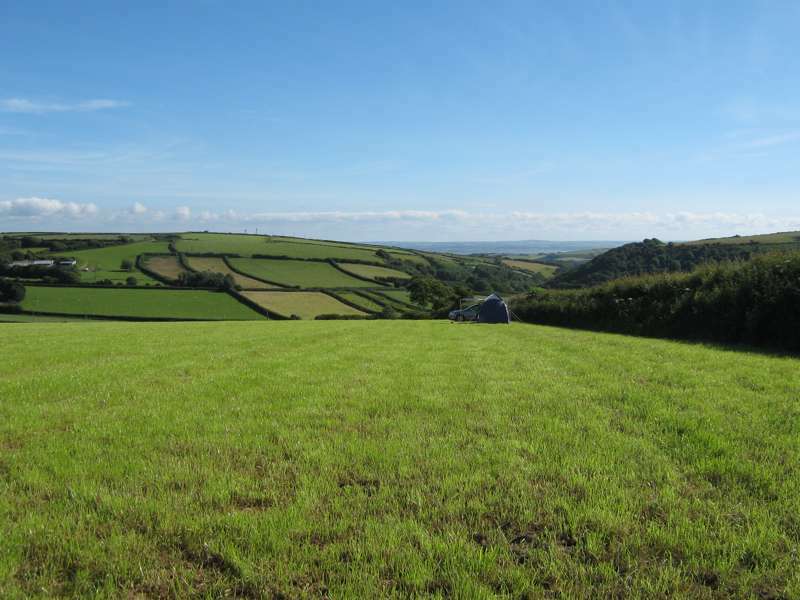 This pitch is small and will only fit a small tent & car or a VW transporter or similar. One of our smaller pitches with a fantastic view. This pitch will only fit in a small tent & car or a VW transporter or similar. One of our smaller pitches. Although not with direct views across the beach, this pitch still has great views of Croyde Bay. One of our medium sized pitches. Although not with direct views across the beach, this pitch still has great views of Croyde Bay. One of our larger pitches. Although not with direct views across the beach, this pitch still has great views of Croyde Bay. The largest pitch on site. Although not with direct views across the beach, this pitch still has great views of Croyde Bay & the sea. One of our larger electrical pitches with direct views across the beach. One of our medium sized pitches with direct views across the beach. One of our small electrical hard standing pitches with direct views across the beach. 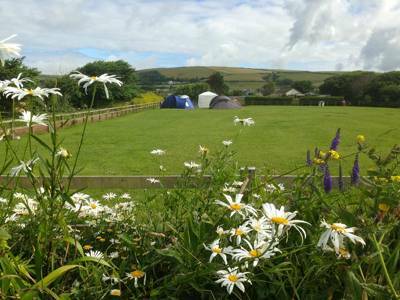 One of our medium sized pitches with uninterrupted views of Croyde Bay. Located at the top of the campsite. 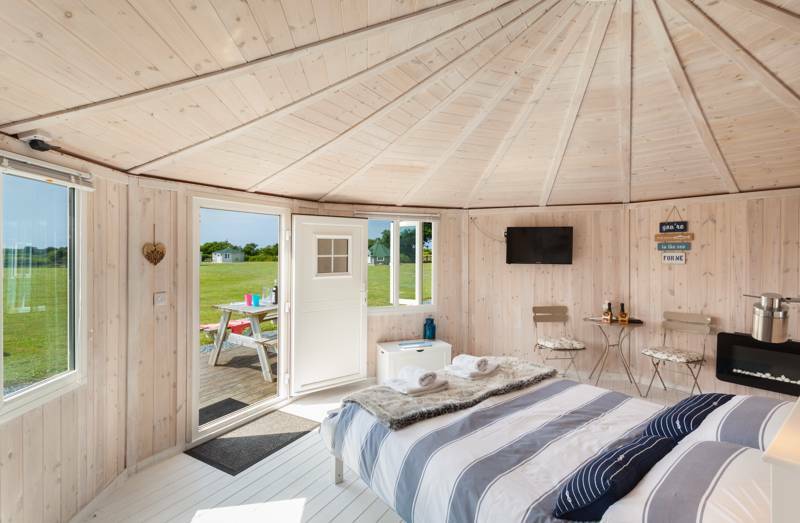 Our pods allow you to unwind and enjoy the spectacular views of Croyde bay. Festival weekend pitch. All pitches divided into two. Tent/Camper must fit well within following pitch size; 6m x 5.5m. Cars are parked in the festival field. Festival weekend pitch. All pitches divided into two. Tent/Camper must fit well within following pitch size; 6.5m x 5.5m. Cars are parked in the festival field. Festival weekend pitch. All pitches divided into two. Tent/Camper must fit well within following pitch size; 7m x 6m. Cars are parked in the festival field. Festival weekend pitch. All pitches divided into two. Tent/Camper must fit well within following pitch size; 7.5m x 6m. Cars are parked in the festival field. Festival weekend pitch. All pitches divided into two. Tent/Camper must fit well within following pitch size; 7m x 5.5m. Cars are parked in the festival field. Thinking of Devon often evokes sepia-toned scenes of cream teas, chocolate-box cottages and rambling on wild Exmoor. Yet this genteel image of the county is only as true as you make it round these parts. Sure, there’s the traditional Devonian charm of sleepy village Georgeham; not to mention the typical seaside ‘candy-floss ‘n’ kiss-me-quick’ chic of the family resorts at Woolacombe. But if you’ve descended upon the North Devon coast with tent on back, board under arm and adventure on your mind, you’ve come to the right place – for Croyde Bay is undoubtedly England’s surf capital. Acres of sand, pounding surf, and bronzed lifeguards... welcome to the Gold Coast. It may be a tad cooler than the Aussie version but, more importantly, it is much nearer for us Poms. Okay, so our cousins down under might enjoy near perma-sunny skies, but on an early summer morning, with the breeze just right, we’d take Croyde over Byron Bay any day of the week. With its lush green hills ravining down to blustery expanses of open beach, there’s no disputing the beauty of Croyde Bay. This wide sweep of dune-backed sand flanked by the finest field-green North Devon hills is the closest thing you’ll find to an Aussie surf beach in this part of the world, gifting awesome waves to pros and beginners alike. 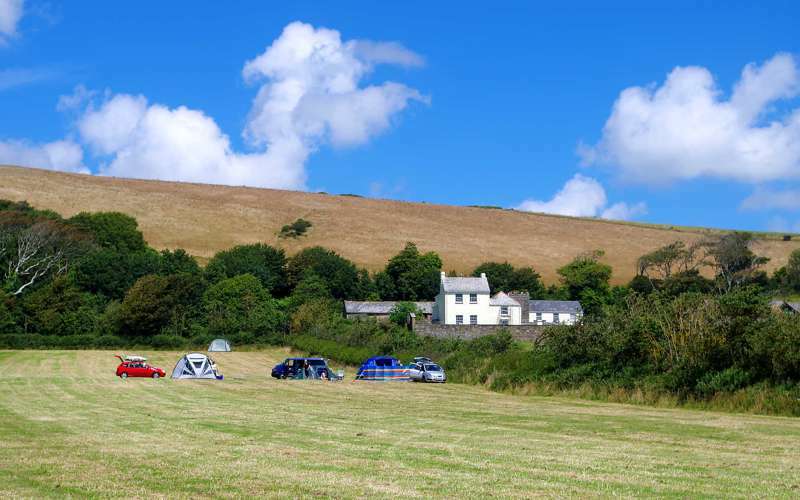 Anyone who was lucky enough to secure a pitch at legendary local campsite Mitchum's will know all about the spectacular views from this enviably elevated spot. Now operating under the new moniker Ocean Pitch, newbies and veterans alike will be pleased to know that surfing is still big on the agenda. As wonderful new owners Benny and Lou are all too aware, surfers are an enthusiastic bunch (to put it mildly). Hours can pass as they scan the endless blue horizon for that elusive perfect wave. But from its priceless vantage point, Ocean Pitch is one of the few campsites in the area with direct beach views, meaning you can keep an eye on the surf from your... erm... ocean pitch, and race down with your board when the waves are breaking. And if you’re not here for the surf, it’s just as great being able to wake up and see the ocean each morning while you cook your breakfast sausages. 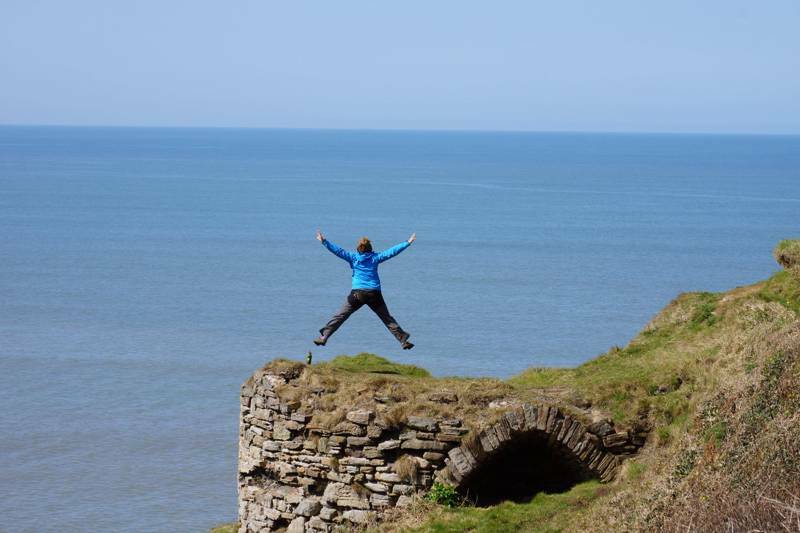 The stunning Croyde Bay provides a perfect canvas for this unparalleled campsite masterpiece, and the site is on the coastal path, so it’s easy to reach the neighbouring beaches on foot. Welcome to Ocean Pitch Campsite in Croyde, Devon. 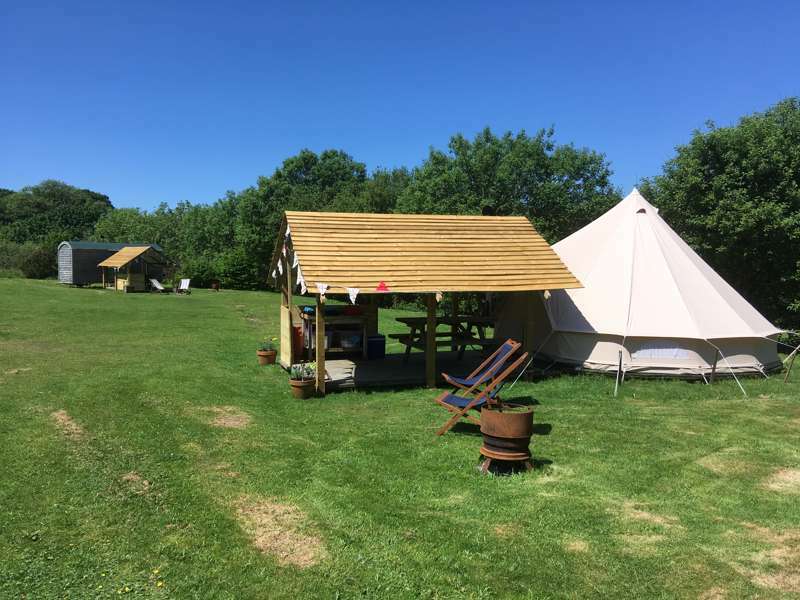 Ocean Pitch offers idyllic camping & deluxe Glamping with outstanding views & within touching distance of North Devon`s finest beach, Croyde Bay. 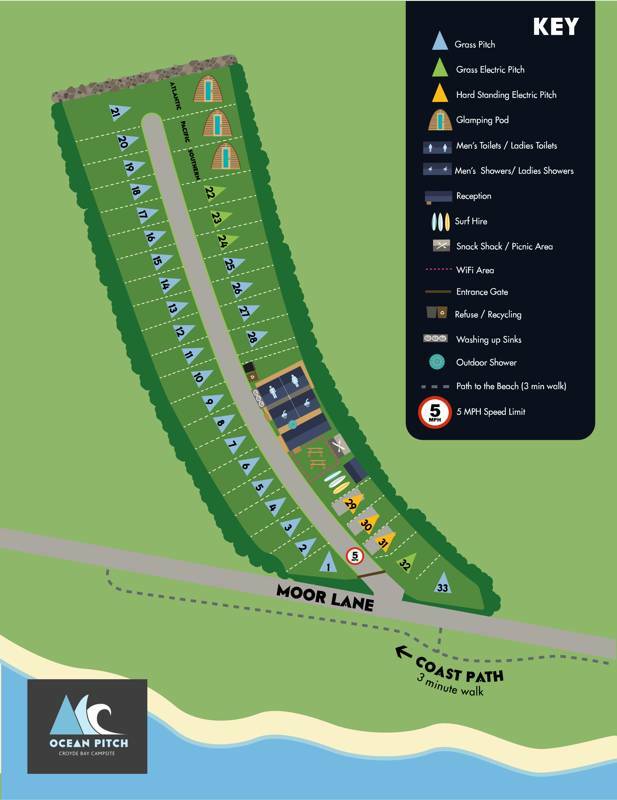 Ocean Pitch offers a friendly, premium camping experience in Croyde with a location ideal for surfing, walking & cycling and provides perfect access to the South West Coastal Path. The campsite is family run by a couple with a fantastic supporting team who are always there to help for any of your camping needs. 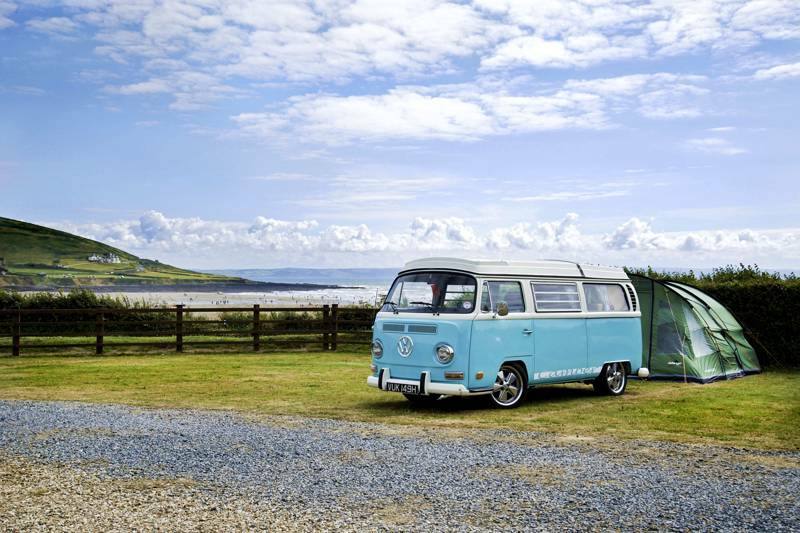 The campsite is fairly small in size which creates a relaxing, chilled out vibe - idllyic whilst looking out over one of the UK's most stunning beaches' & surf break. The toilets and hot showers are not only modern, but they're spotless & there is also free Wifi as well as mobile phone/ tablet charging facilities. 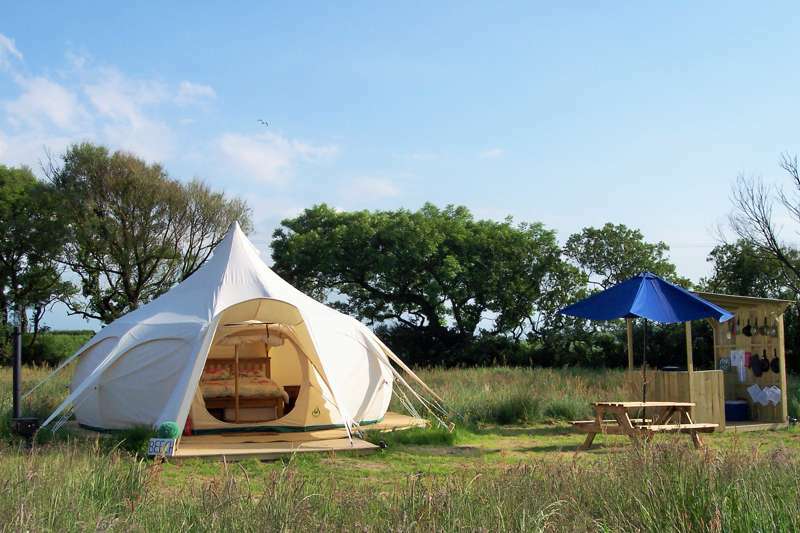 Ocean Pitch also offers a deluxe Glamping experience, Pod Glamping, which is Croyde’s answer to quality, luxurious camping and offers a premium, idyllic experience. 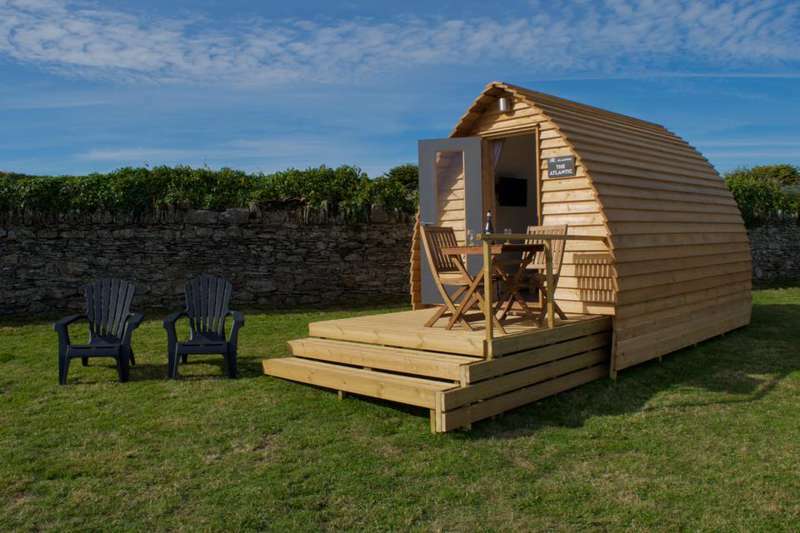 Located at the top of the campsite, our pods allow you to unwind and enjoy the stunning views of Croyde Bay. Whether you’re looking for a romantic weekend getaway or simply fancy the idea of camping but with the luxuries of home, Ocean Pitch Pod Glamping has it all. 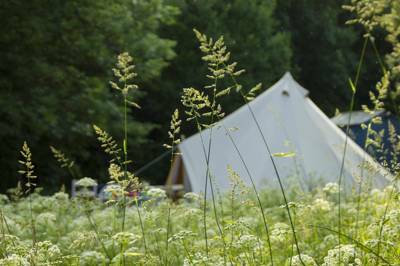 Come & experience North Devon's best kept campsite secret for yourself - we looking forward to welcoming you on-site. For latest availability and best prices for Ocean Pitch Campsite, please use the Date Search above. 40 pitches all with views of Croyde Beach and the ocean. 5 electrical hook up pitches available. 3 premium deluxe glamping pods. 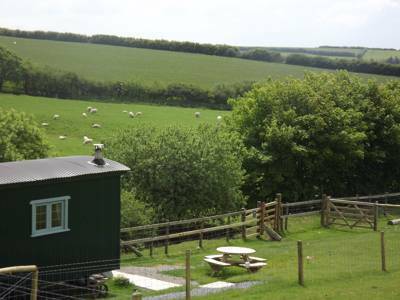 Hot showers, immaculately clean toilets, outside cold showers for washing wetsuits, outside washing up basins, free WiFi internet access, mobile phone/ tablet battery charging in reception, on site catering (The Snack Shack), surf hire, friendly staff on site 24hrs. Book some lessons with Surfing Croyde Bay or Surf South West or take advantage of the stunning heritage coastline path with a walk to Baggy Point. Croyde Bay also hosts the annual Oceanfest – a beach, sports and music festival in June. To see how it all began, visit the Museum of British Surfing in Braunton. Here you’ll find a detailed history of the long board in our native waters, including sketches of Hawaiian surfers by Captain Cook’s crew, airbrushed surf art on early boards and photos of the locals riding the waves on wooden planks in the 1920s. You may also be surprised to learn that Devon’s most famous daughter, none other than Agatha Christie, was an early surf pioneer who mastered the art of stand-up surfing in Waikiki. Horse riding on Croyde beach is a must-do experience, whether a leisurely beach trot or epic country trek, exploring Croyde on horseback is a great way to soak up the atmosphere. The family- run, pretention-free Roylands Riding Holidays is based in central Croyde and welcome experienced riders and first-timers all year round. Discover the area on two wheels by hopping on the Tarka Trail and exploring the beautiful coast and countryside. Bikes can be hired from Tarka Trail Cycle Hire (01271 813339) in Braunton. Scoff a Devon cream tea at Centery Farm (01271 879603). The Thatch (01271 890349) pub is a lively surfers’ hangout with decent food. The Blue Groove (01271 890111) combines laid-back beach-bum vibe with trippy artwork and an internationally eclectic menu that includes Thai curries, Mexican pancakes and Japanese noodles. In the village of Georgeham, just inland, try the food and real ales at The Rock (01271 890322), where they do a great Sunday lunch and serve lunch and dinner daily in a light, bright conservatory. For some of the best fish and chips you’re likely to have on the North Devon coast, go to Squires Fish (01271 815533) in neighbouring Braunton. They’ve been frying the freshest Devon-caught fish here since 1969 and the stylish 2-floor restaurant attracts many celebrity admirers, not least Rick Stein. Find out more about organic farming and conservation at the dairy at West Hill Farm (01271 815477) and taste their wares. You can buy cold drinks and chocolate bars onsite, plush they have a cool retro slush puppy machine! Ivan's cool split screen, coffee-serving campervan also parks up in the peak season. £15 per person per night; £3 per car per night. Kids 15 Years & under are half price but we do not accept bookings for under 3 year's. 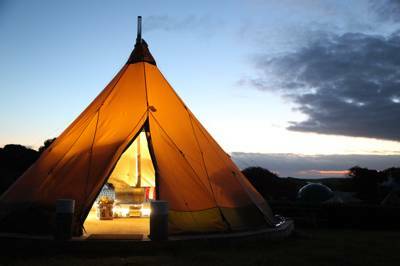 Pod Glamping £99 per night. Surfboard hire £12 per day; Body Board hire £8 per day; Wetsuit hire £8 per day; Stand Up Paddle board hire £25 half day or £40 full day, Surfboard & wetsuit £16 per day; Body board & wetsuit £13 per day. Ocean Pitch is the closest campsite in Croyde to the beach. Once you come into Croyde drive through the village and turn left onto Moor Lane towards the beach. Drive half a mile down this road until the beach is on your left hand side & Ocean Pitch is the last field on your right – signage outside. From Barnstaple train station walk the 10 minutes to the bus station and take bus 308 to Moor Lane, Croyde. Benny and Lou can do shuttle run collections/drop offs for a small fee (maximum of 4 people). Alternatively, call Saunton Taxis for the best local price.